Conceptualised by Jaideep Bhandari; Palate of Delhi provides casual, easy dining options along with plush interiors and stunning artwork that set this food complex apart. A gastronome's pleasure garden, Delhi is believed to be India's foremost food destination as it is a melting pot of versatile food cultures and cuisines. In addition to being India's political heart, for decades now, the capital’s love affair with food has unanimously been celebrated. Delhi now adds another premium food hub to its ranks of culinary destinations - Palate of Delhi (POD). Pegged to be one of the finest destinations for quick and convenient food, Palate of Delhi is comfortably located at the Dhaula Kuan Metro Station. Despite being a prime area nestled amidst the Army Cantonment region, with Delhi University’s South Campus and Diplomat Enclave around the corner; Dhaula Kuan has a dearth of organised food galleries. With NH8 running across and a 0.9 km moving walkway (Travelator) to link commuters to South Delhi on Delhi Metro’s Yellow line in the works, the region is also very well connected. POD bridges this gap by making available an easy dining experience to the masses. Offering relief to commuters travelling along the packed Delhi-Gurgaon route as well as to South Campus college students looking for a clean, quick, pocket friendly meal post classes; POD really does have something for everyone. Conceptualised by Jaideep Bhandari; Palate of Delhi provides casual, easy dining options along with plush interiors and stunning artwork that set this food complex apart. Modern, functional and housing some of Delhi’s favourite eateries, it is touted to be the next big hangout spot for the Delhi public. With fresh new elements on the table, the food gallery gives visitors additional reasons to look forward to. Spread over 12,000 square feet, it has a well thought out structure, a chic colour scheme running throughout the space, beautiful artwork adorning the walls and modern, comfortable seating - elements that enhance the ambience at POD. It truly is a boutique food gallery. An exciting feature is the POD Stories, a wall, which provides the perfect outlet for customers to pen their thoughts. The walls of Palate of Delhi are unique with sketches throughout the gallery.While one side captures what it’s like commuting in the Delhi Metro, the other side is an ode to noteworthy individuals who have made an unforgettable mark in the capital city. POD is proud to host Delhi NCR’s first ever Burger King drive-thru; giving convenience and food on the go a whole new meaning. Rushed early mornings and unforeseen hunger pangs will no longer be a problem with this speedy service en route. It is set to provide respite to a city that is perpetually on the run. With an ever-growing population of conscious eaters embracing healthy living,Delhi has seen the emergence of various outlets capitalising on this very trend- one of which is Chaayos. 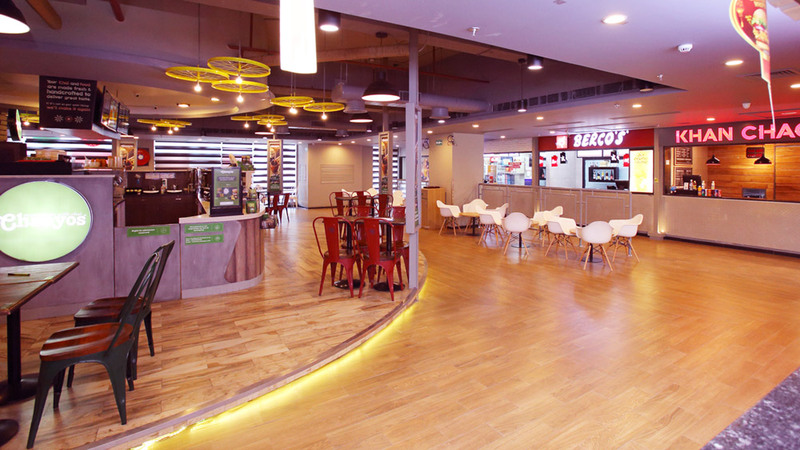 Allowing customers to make chai in 12000 different ways, the chain will debut its first premium lounge at POD.Further, Palate of Delhi has opened its doors to the 1100th outlet of Dominos, India’s beloved pizzeria. Classics like Khan Chacha, which has been serving legendary rolls that generations have sworn by; Keventers, the Connaught Place gem that recently opened outlets around the entire city, fuelling a milkshake obsession; Moti Mahal Delux, the epic curry house that has consistently defined comfort food for the Butter Chicken crazed population and Haldiram’s, Delhiites’ go-to for all savoury and sweet cravings - occupy prime spots at the complex. Other favourites such as the American donut giant Dunkin Donuts, which has come to consume a special place in every foodie’s heart not only for its donuts and coffee but also for its big meaty burgers; the much loved pizza parlour Chicago Pizza, ice cream giant Baskin Robbins and the family favourite Bercos among others, are present to cater to your fast food needs.Palate of Delhiexemplifies an eclectic mix of the best.